Why Advertise With RP Photonics? 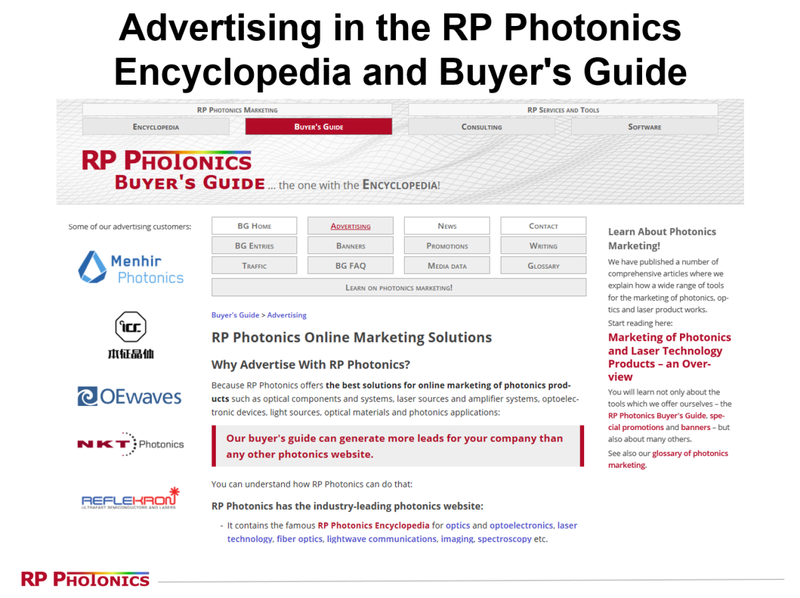 Our buyer's guide can generate more leads for you than any other photonics website. and totally for free for the users! users from industry and science – who else would use such a resource? Most importantly, the ad package will allow you to display an unlimited number of products, and each one with a product description and an image – on your company profile page, on the list of suppliers for that product, and also in the corresponding encyclopedia article, if there is one. In addition, you get a strongly enhanced company profile page, one included targeted promotion for a white paper or video in an encyclopedia article, and one advertising banner (see below). Try it out, see the results (e.g. with your server statistics and the statistics we will give you), and we bet that you will be convinced!